HUDMON CONSTRUCTION COMPANY, INC., v. SMITHS WATER AND SEWER AUTHORITY, GOODWYN, MILLS & CAWOOD, INC., et al., Construction and Contract Litigation. Breach of Contract $330,000 Jury Verdict and $1,485,000 Fraud and Punitive damages Jury Verdict for our client Hudmon Construction Company. FRANK GILLIS, M.D. v. JOEY FRAIZER, AS EXECUTOR OF THE ESTATE OF FLORINE BRYANT, Medical Malpractice-Wrongful death. Jury verdict of $5,000,000 for our client, Joey Frazier. THE STATE OF ALABAMA, v. PHILLIPS FAMILY PARTNERSHIP, LTD. An Alabama Limited Partnership, et. al. Regarding: Eminent Domain/Condemnation. $2,027,068 Jury Verdict for our client, Phillips Family Partnership. CHRISTINE JACKSON v. MUTUAL LIFE SAVINGS, et. al., Regarding: Insurance Fraud. $712,612 Compensatory and Punitive damage Jury Verdict for our client, Christine Jackson. MIKE DAVIS, et. al. v. HANSON AGGREGATES SOUTHEAST, INC. et. al. Complex Environmental Litigation: Defense Verdict for Hanson Aggregates Southeast. Rick Davidson is a native of Auburn, Alabama. Growing up in Auburn, Rick attended Auburn City Schools and graduated from Auburn High School. Rick later graduated from Auburn University in 1990. He earned his law degree from the University of Alabama School of Law in 1994 and was admitted to the Alabama State Bar that same year. After law school, Rick began practicing law with Sasser & Littleton in Montgomery, Alabama, where he worked until 1997. 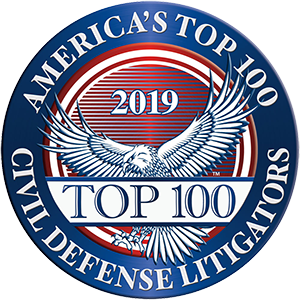 Rick’s practice was primarily in the areas of banking law and insurance defense litigation, including defending automobile accident litigation, manufactured home litigation and termite litigation. In 1997, Rick moved back to Auburn and practiced with the Walker-Hill firm and the Adams, Umbach, Davidson & White firm until founding Davidson, Davidson & Umbach in 2014. Rick and his wife Kelly, along with their three boys, Walker, Luke and Patrick, are members of Holy Trinity Episcopal Church where Rick has served on the vestry and chair of the Finance committee. In addition to his full time practice of law, community and professional involvements, Rick coaches youth sports including football and baseball in Auburn. Rick enjoys being outdoors quail hunting and spending time on Hatchett Creek with his family.